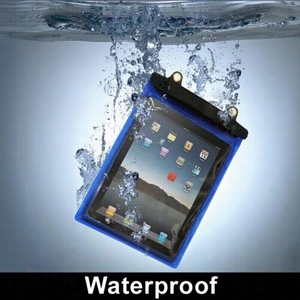 Waterproof Pouch for Ipad and Tablet PC. 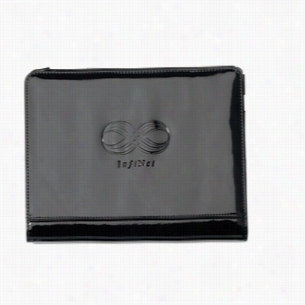 This waterproof Pouch is made from durable, flexible, clear vinyl and allows full operation of the touch screen interface of your Ipad and/or tablet PC without fear of getting it wet or dirty. With a combination of triple seal, Velcro-type closure and snaps this Case protects your iPad against water, dust, dirt, sand and other elements, making it the perfect companion for your iPad at the beach, poolside or even in the kitchen. 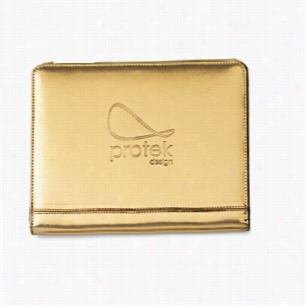 The case also features a removable strap that can be adjusted to carry over your shoulder or around your neck. 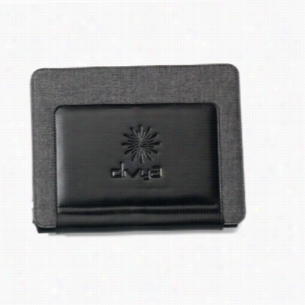 Conductive material allows your capacitive touch screen to be used while your device is still in the bag. 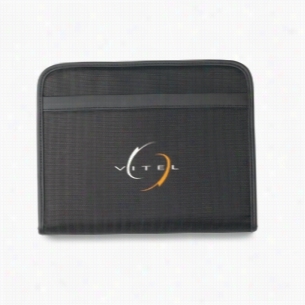 Durable outer and soft inner liner protects your iPad while on the go. Three position stand mechanism allows iPad to rest low for typing or high for watching videos. Artistic opening allowing for back of iPad to be displayed to the masses. Access to camera, Speaker and all input/output jacks. Includes a tethered cleaning cloth to avoid smudges and elastic band to help encase iPad. Fits all generations of iPad. Hype iPad Stand - Black. Slim, stylish tablet stand provides ultimate protection for your iPad. Elastic closure strap keeps the front cover closed while adding a splash of color to the design. Elastic corners safely secure iPad. Folds into a multi-position stand for ultimate viewing of your iPad. Faux suede interior provides maximum device protection. Includes camera hole feature. Fits iPad 2 and the new iPad. Materials: Simulated Leather. Doubles as a protective carrying case and a presentation stand. Folds into multi-angle stand for viewing. Clean Screenâ„¢ gently removes dust and fingerprints with an easy swipe. Unique feature enables iPad sleep mode when closed and turns it back on when opened. Molded camera hole feature. 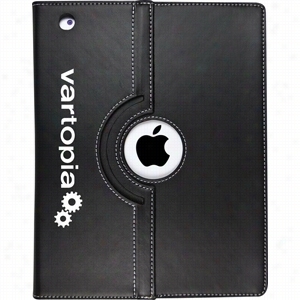 Designed to fit the iPad, iPad 2, iPad 3rd generation and iPad 4. Stylus loop (stylus not included). 2-piece Gift box included. Materials: Tweed/Simulated Leather. Millennium Leather Folio for iPad Air. 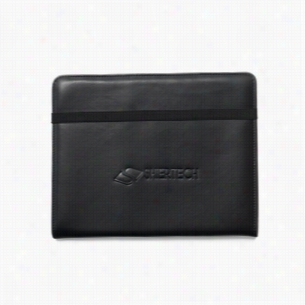 Millenium Leather clips easily to your iPad Air for superior protection and a sleek professional look. With two viewing angles the Case allows you to optimize your viewing experience. The case also acts as an on/off switch as it puts your iPad to sleep or wakes up your iPad when opening and closing the case. Manufactured By Leeds. Swivel Leather iPad Stand with Sleeve. Slim, protective Case with frameless mount easily snaps onto iPad. Elastic strap closure. 360 degree rotating stand adjusts for portrait or landscape viewing. Unique feature enables iPad sleep mode when closed and turns it back on when opened. Sleeve secures the tablet to your hand to allow for a comfortable position while viewing your tablet. Camera hole feature. Compatible with iPadÂ® 2, 3rd generation and iPad 4. Fabric/Material: Leather. Doubles as a Protective carrying case and a presentation stand. Folds into a multi-angle stand for ultimate viewing. Unique feature enables iPad sleep mode when folded and turns it back on when opened. Clean Screen feature gently removes dust and fingerprints with an easy swipe. Protective case with slim mount frame safely secures iPad. Camera hole feature. Compatible with iPadÂ® 2, 3rd generation and iPad 4. Gift box included. Materials: Simulated Patent Leather. Doubles as a Protective carrying case and a presentation stand. Folds into a multi-angle stand for viewing. Unique feature enables iPad sleep mode when folded and turns it back on when opened. Clean Screenâ„¢ feature gently removes dust and fingerprints with an easy swipe. 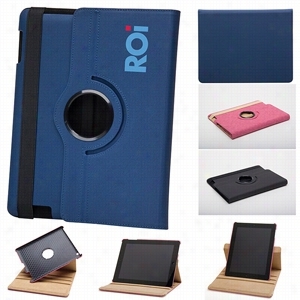 Protective case with slim mount frame safely secures iPad. Camera hole feature. Compatible with iPadÂ® 2, 3rd generation and iPad 4. Gift box included. Materials: Leather. Travis & Wells iPad Stand E-Padfolio. Front slash pocket. Zippered closure. Snap-in frame and adjustable kickstand for multiple viewing angles of your iPad. Elastic strap closure secures iPad in place during storage. 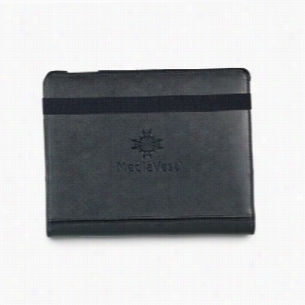 Removable Velcro insert with 5" x 8" paper pad accommodates left and right hand users. Clean Screen feature gently removes dust and fingerprints with an easy swipe. Pen, stylus loop. Compatible with iPad 2, 3rd generation and iPad 4. Travis & Wells gift box included. Materials: Ballistic/Simulated Leather Trim.